Beautifully simple interface. Simply beautiful results. Is your company easy to do business with? If you don’t have a decisive answer on the matter, your business partners surely do. Through Esker’s collaborative e-commerce workspace, you can rise to the challenge by offering your customers and suppliers a self-service outlet to easily manage their documents and resolve issues, while reaping the benefits of faster, more transparent and less expensive business processes. time & money previously allocated to status calls/emails. customer/supplier loyalty thanks to streamlined processes. order fulfillment, cash collection & supplier payment. greater collaboration & visibility from start to finish. Cut out the middle man — paper. Your business partners hate dealing with paper and tedious manual tasks just as much as you. Esker's customer portal software and supplier management software span the O2C and P2C cycles, empowering all parties to access documents directly on the portal 24/7 and avoid shared pains. Customers can accurately place orders directly from your e-catalog of products and/or services. Customers can save time on frequently ordered items by simply reloading past orders. Orders are automatically queued for verification, eliminating data entry and speeding up fulfillment. 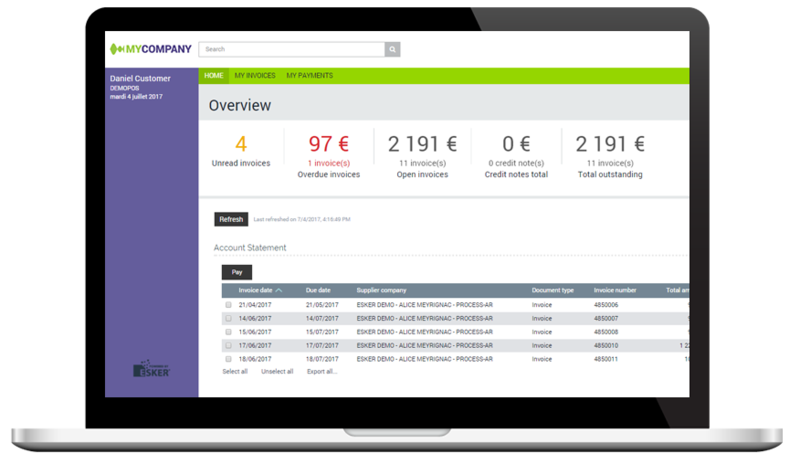 Customers can easily log a dispute and enter the dispute reason directly on the invoice. If an urgent payment is needed, customers can quickly pay their invoices online. Your company’s and customers’ orders and invoices are separately and securely e-archived in compliance with all European Directives and regulatory frameworks like the Sarbanes-Oxley Act, and are made accessible to authorized personnel and external tax auditors. Speed up turnaround of employee requests for goods and services via an electronic workflow and portal e-order upload. Suppliers can e-submit invoices and related documents directly on the portal. E-invoices are automatically queued for verification and processing, eliminating data entry and accelerating payment. Supplier invoices are e-archived and accessible via a secure portal. E-invoices are archived in compliance with all European Directives and regulations, and are accessible to authorized personnel and external tax auditors. Resolve disputes instantly with intuitive chat tools. Drama stinks. With Esker, companies can clear the air before disputes turn contentious thanks to real-time information exchange. Access to chat tools also increases the likelihood of processing orders and paying invoices on time or even early. What's more, Esker’s customer and supplier management software also stores shared information so that both parties can refer back to it as needed — a great safeguard for reducing potential risks for all involved. More visibility means fewer status calls. Was my invoice received? When will I be paid? Has my order been processed? How soon will it be delivered? Sigh ... it’s hard to be productive when you're fielding customer calls and chasing down payment approvals on a regular basis. Esker’s portal dashboards put an end to time-consuming status calls by giving customers and suppliers the self-service access they expect while, in turn, freeing up team members to focus on strategic tasks that drive added value and profitability for your business. Create a consistent and coordinated onboarding experience. Upload contact lists directly from an ERP system or schedule file transfers to auto-refresh your onboarding list. 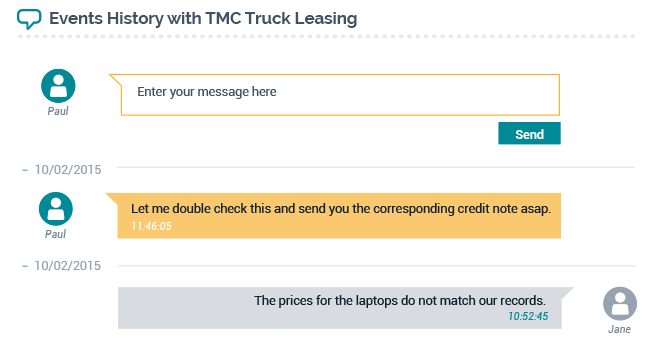 Prompt suppliers and customers to connect using preset notifications or by attaching a letter to paper invoices. Customize Esker’s interface to help your suppliers and customers better identify with your corporate identity. software. Just say the word, and our experts will be happy to fill you in!